Illovo Sugar South Africa (Pty) Ltd (Illovo SA) is South Africa's largest sugar producer, accounting for about 30% of the country's sugar production, and is a significant contributor to South Africa's economy. The company plays an important societal role, supporting direct and indirect employment in rural areas through its value chain, providing financial support, technical assistance and capacity building to smallholder farmers, and supporting the South African government's development and land reform agenda. Illovo SA is also a producer of renewable energy and continues to reduce its environmental impact. During the 2016/17 financial year, the company's total economic impact on the local economy has been estimated at R9.6 billion, comprising R1.4 billion in direct impacts with the balance resulting from the multiplier effects of its business operations within the supply chain and wider economy. This impact is revealed in a report undertaken by Corporate Citizenship, an independent, global management consultancy specialising in social impact assessment, sustainability and corporate responsibility. Mamongae Mahlare, MD of Illovo SA says, "As a business, we endeavour at all times to deliver on our shared value mandate, while actively supporting the government's social and economic development agenda. We are committed to the transformation of our business in South Africa, but recognise that to keep ourselves focused and on track, we need an independent benchmark against which to measure our real contribution. The last report was completed in 2012/13 and we have assessed our progress against this to ensure we identify gaps - or areas of improvement - early as well as take the time to celebrate achievements." For example, spending on local suppliers increased 20% to reach R4.2 billion, payments to employees in the form of salaries, benefits and wages increased by 49% to R871 million and during the period, the company continued to reinvest in the business spending R550 million on capital investments. Total direct tax paid by the company in 2016/17 amounted to R82.5 million, while indirect taxes totalling R174.2 million were collected on behalf of the government. Illovo is estimated to support at least 25 330 jobs in South Africa. For each of Illovo's 3 500 direct employees in South Africa (including Illovo SA and Illovo's corporate offices based in Durban), at least six jobs are supported through outgrower communities and wider multiplier effects throughout the economy. The direct jobs provided by the company contribute to supporting the livelihoods of 13 292 people once families and dependants are taken into account. This is based on an average household size of 3.8 people in KwaZulu-Natal. Illovo SA's supply chain includes nearly 3000 outgrower farmers, in total supplying between 4 and 5.5 million tonnes of sugar cane every year. Illovo SA is estimated to support over 17 600 jobs through outgrower farmers. In addition, the company provides significant technical, financial and capacity-building support to outgrowers, worth R 5.3 million in 2016/17. contribution to the South African Sugar Association's education and development programmes. All employees and their families can access healthcare services though Illovo SA clinics and medical aid benefits. Furthermore, Illovo SA seeks to actively address HIV in the region through a wellness programme, with over 400 people currently enrolled, targeting those who are HIV positive. 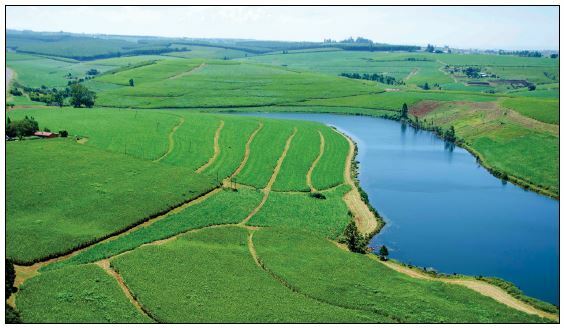 Land redistribution initiative has resulted in the sale of 28 086ha - comprising 55% of its own land portfolio - to black people and in the process, has facilitated the establishment of more than 50 black commercial farmers. Two of the four Local Grower Councils who supply cane to Illovo SA have adopted the SusFarMS environmental management system, which was pioneered by growers who supply their cane to the Noodsberg factory, in partnership with WWF. In South Africa, 75% of Illovo SA's energy consumption is provided from renewable sources, primarily bagasse, and 53% of all water used is cleaned and returned to source. Illovo has a significant downstream economic impact, through the estimated 200,000 small retailers who sell Illovo SA products within South Africa. Domestically, direct consumers make up 12% of Illovo SA's sugar product sales, with the remaining 88% being sold to industrial customers manufacturing sugar containing products. is to provide science-based information about the role of sugar in the human body, to help consumers make informed choices. "We identified critical areas such as job creation, capacity building and skills transfer, supply/value chain development, land rights and environmental stewardship as key to our own success - and that of the local and national economy. We were very pleased to note that we have made solid progress in meeting our commitments and feel confident that our ongoing transformation strategy and shared value agenda will continue to deliver results," concludes Mahlare.